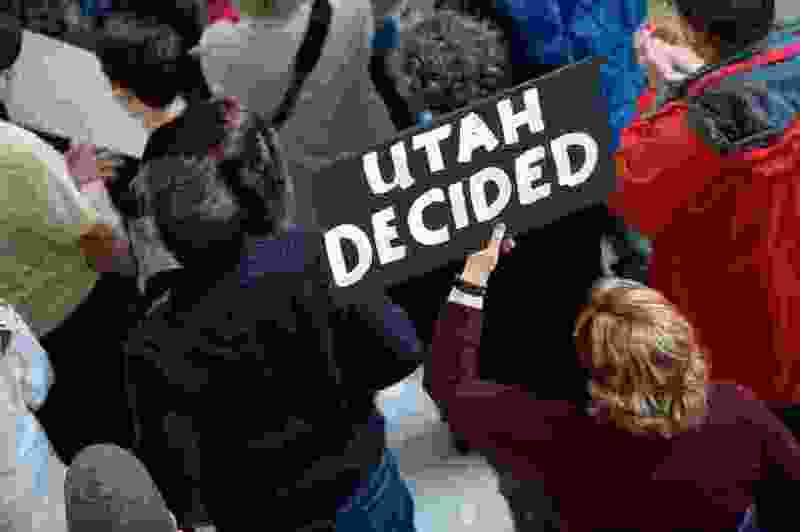 (Francisco Kjolseth | The Salt Lake Tribune) Over 300 demonstrators fill the Capitol rotunda on Monday, Jan, 28, 2019, on the first day of the Legislative session to rally in support of protecting Proposition 3, the Medicaid Expansion law recently passed by voters. The Utah Senate’s final vote on a partial Medicaid expansion plan was delayed Friday, frustrating Republican efforts to quickly replace a voter-approved, full-expansion initiative. Senate Majority Whip Dan Hemmert, R-Orem, said a new version of SB96 with “technical changes” is being drafted, partly in response to a preliminary budget analysis that found the plan to be more expensive than some of his colleagues could take. “I know it came in at a number that people weren’t excited about,” Hemmert said. Hemmert was unable to provide exact figures, but said Senate leaders are looking at adding roughly $30 million in funding on top of the $90 million raised by a sales tax increase in Proposition 3. That would create an 18-month “bridge” fund that the state would use starting April 1, when new enrollees making up to 100 percent of the poverty level are added to Medicaid, to when the state receives a waiver from the federal government covering 90 percent of the state’s Medicaid costs. No other state has received such a waiver, and until Utah’s request is granted the state would have taken on a more expensive program that covers fewer people than full Medicaid expansion under Proposition 3. Friday’s delay marked a change in momentum for the fast-moving bill, which was expected to go to the House next week, and it coincided with the launch of more than $100,000 in television ads supporting Proposition 3 and criticizing Utah lawmakers for the efforts to repeal the initiative. A truck adorned with digital billboards and paid for by Utah Decides has also circled the Capitol complex during the first week of the session, showing the message “Respect Voters” and other pro-initiative statements. Under Proposition 3 — which received 53 percent of a statewide vote in November — roughly 150,000 Utahns earning up to 138 percent of the federal poverty level would be allowed to enroll in Medicaid, paid for by a $90 million state sales tax increase and $800 million in matching federal funding. But estimates by the Governor’s Office of Management and Budget suggest revenue generated by the initiative would fall $10.4 million short of Medicaid costs by 2021, and $64.5 million short of costs by 2024. Legislative leaders say those costs necessitate a more restrictive plan like SB96, which would expand Medicaid to include those earning up to 100 percent of poverty, with the remaining expansion population able to purchase subsidized insurance from the Affordable Care Act individual marketplace.